Dubai, UAE, January 27, 2019 - The Department of Economic Development – Ajman (DED Ajman), signed a Memorandum of Understanding (MoU) with Dubai SME, to implement several initiatives aimed at enhancing cooperation that support national entrepreneurs. The MoU seeks to fulfil key initiatives for SMEs such as signing them in various concessions, providing the best training and marketing strategies for their projects and products, collaboration in events and exhibitions, and sharing of experiences for research and studies related to the growth of SMEs. H.E. Ali Issa Al Nuaimi, Director General, DED Ajman and H.E. Abdul Baset Al Janahi, CEO, Dubai SME signed the MoU at the DED Ajman headquarters in the presence of several officials from both entities. The MoU provided the framework for cooperation between the two parties aimed at strengthening their cooperation through an agreement and achieve their shared vision and goals towards boosting entrepreneurship among citizens. 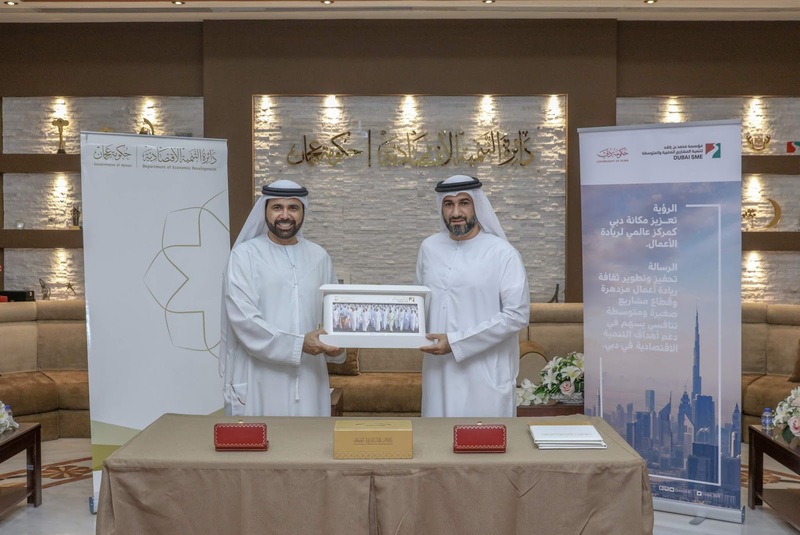 The agreement includes making concessions available for (SMEs) within both emirates, including the registration of DED Ajman members in the government procurement program of Dubai SME, which allocates 10 per cent of the purchases to registered members of any government entity. It also incorporates cooperation agreement in areas of research and providing statistics and data for projects in the sector as well as collaboration programs aimed at providing training courses in entrepreneurship, marketing and organizing exhibitions. Abdul Baset Al Janahi, CEO, Dubai SME, said: "We are delighted to be partners with the Department of Economic Development in Ajman towards achieving our shared vision of supporting youth projects and developing a generation of entrepreneurs through collaboration, exchange of experiences and a package of services. Our partnership is also aligned to the vision and direction of the UAE to promote entrepreneurship, develop small and medium enterprises, and bring added value to the economy of Dubai, Ajman and the UAE in general given the growth potential of our local companies. Dubai SME has the expertise to assist and guide entrepreneurs in navigating the market successfully through development, advisory and training programmes, thus enabling them to focus on growing and expanding their project.